DIY Kittynip CraZy Toy — SO EASY!!! Got some burlap? Leather? Fabric scraps hanging around? Got a kitty who has sharp nails? He’s a really special cat because he LOVES any kind of toy I make for him. My little earth saving, arisetotrashtic, meowzer. I thought I’d treat him with something a little more special. 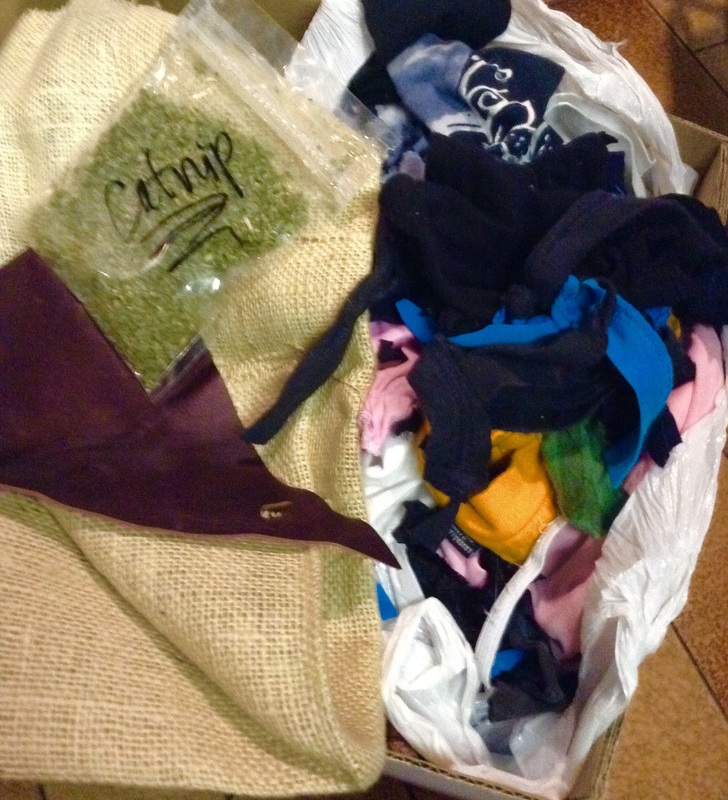 Organic catnip for my kitty Christmas craft idea, and I had everything I needed to get to work. What feels so awesome about this project is that I got to support an awesome shop on Queen West called Good Catch and this project only cost me under $6. Score! plus, Atticus is happily making his claws less sharp/being active. Win, win. 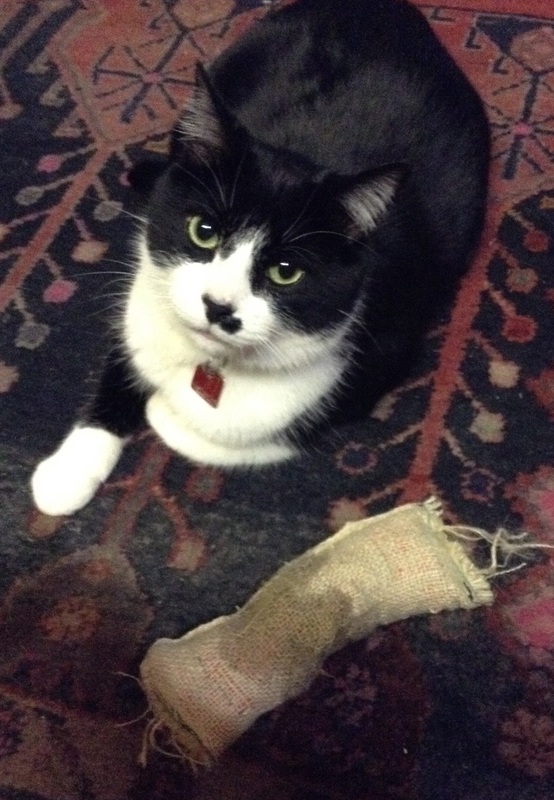 My trusty sewing machine + some cotton and leather scraps + burlap + CATNIP = best toy ever! You don’t need to be exact, just cut out a huge square of burlap*, fold it in half and sew around all edges but one. Make a slightly smaller square out of thinnish cotton or a breathable material. Do the same. *if you want to add some extra cat-claw dulling action, sew some random patches of thick leather scraps to the burlap before you sew it into a rectangle shape. 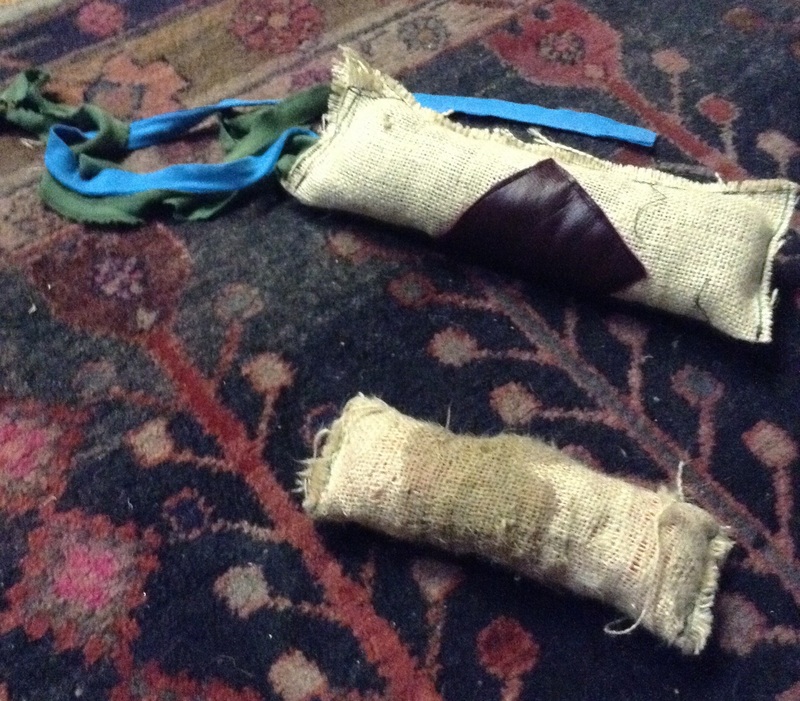 The burlap rectangle is going to be the outside of the cat toy. The cotton one will be the inside. Stuff the cotton rectangle 1/3 with fabric scraps [make sure tags or anything pokey and unsafe for kitties is thrown away!!] and fill the next 1/3 of the rectangle (or more, if you like) with CATNIP. Stuff the rest of the now cushiony rectangle with cotton. 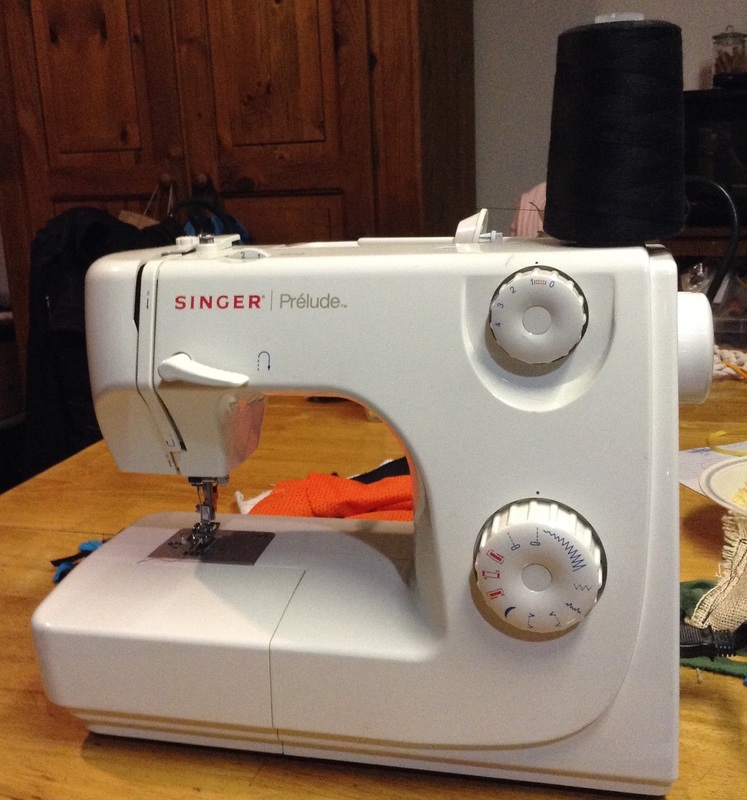 Sew that cotton rectangle shut! This is the part where making the burlap rectangle a bit bigger (or the cotton one smaller) makes your life a lot easier. Stuff the cotton rectangle that is now 2/3 scrap fabric +1/3 catnip and totally sewe shut INTO the burlap rectangle. Sew the stuffed burlap kitt toy shut and BAM! Your done! The one in the front is the soggy prototype.